Tantric Buddhism, or the Vajrayāna (Diamond Way) forms the third major phase of Buddhism's development, which lasted from about 500CE to 1,000CE. In reaction to the extraordinary time-scales envisaged by the Māyāyana, the Tantra emphasised direct experience and the achievement of Enlightenment in this lifetime through the practice of esoteric rituals and meditations, and the engagement of magical energies. Buddhism was introduced to Tibet in the 8th century by the scholar monk Śāntarakṣita, and most successfully by the Tantric adept Padmasambhava, whose biography has been so extenively mythologised that he has become more an archetypal figure than a historical one. Tibetan Buddhism is also practised in Nepal, Mongolia, Bhutan, etc. There are four main traditions, whose doctrines differ only to small degrees, the emphasis being on different founders and lineages of teachers. Nyingma means ’ancient‘, and is the school founded by Padmasambhava, who they regard as a second Buddha. Many Nyingma teachings, called termas, are said to have been hidden by Padmasambhava and subsequently 'discovered'. The best known of these is the Bardo Thodol known in the west as the Tibetan Book of the Dead. The ‘Whispered Transmission‘ (or Red Hat) tradition was founded by Gampopa in the 11th century, and can be best seen as a group of affiliated lineages rather than a unified order. 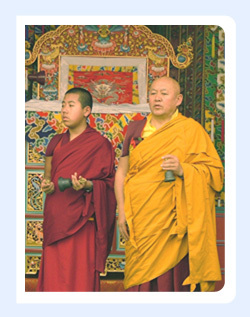 The best known sub-school is the Karma Kagyu (Black Hats) who are credited with introducing the idea of reincarnation of lineage heads as a tulku. There are currently two competing claims for the position of Karmapa, the head of the Karma Kagyu traidition. The Sakya (literally ‘Pale Earth’) tradition was founded by Drogmi (a disciple of Naropa and others) in the late 11th century. There are two subsects, the Ngor founded in the 14th century, and the much smaller Tshar founded in the 15th century. The 19th century Sakya master Jamyang Khyentse Wangpo was a co-founder of The Rimé movement, which sought to bring together the teachings and lineages of all the Tibetan schools. The Gelug (or ‘Yellow Hat’) school was founded by the great scholar and teacher Tsongkhapa in the early 15th century. The best known member of the Gelug tradition is the Dalai Lama, although the head of the order is technically the abbot of the first monastery that Tsongkapa founded, the Ganden Tripa. The Dalai Lamas came to be the political leaders of Tibet in the 17th century, and the current holder of the post Tenzin Gyatso has now semi-retired from the complicated job of being the leader of the Tibetan Government in exile as well as the spiritual leader of the Tibetan people. The main Vajrayana school outside Tibet is the Japanese Shingon tradition. One of the early names that the Vajrayana used for itself was the Mantrayana (‘The Way of the Mantra’), and the name Shingon developed in the same way that the name Zen evolving from the Sanskrit word Dhyana: the Chinese translated the Sanskrit word mantra as zhēnyán (‘True Word’), which the Japanese pronounced as Shingon. Shingon was founded by the monk, scholar, poet, artist Kukai, who studied and received Tantric initiations in China. The tradition focuses ritual, meditation and a fairly small number of esoteric texts with an emphasis on the archetypal Buddha Vairochana.